Saturday 8th July saw the All Ireland Championships held at Lisburn Bmx Track.. There was a Great turn out , with over 100 competitors entered, some from as far as Cork.. The Weather was fantastic, and the track immaculate (Well done LCBMX)..
in the footsteps of Racing Dads Pete & Ian. 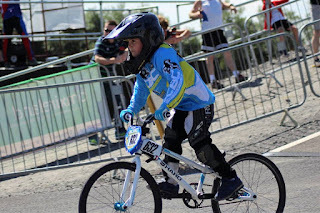 3rd was BCBC new member Nico Ferguson..
Moving onto the Under 6 year olds, Evan 'The Bullet' Bartley proved unstoppable all day, with our very own Jamie Harron pushing him close on several occasions.. What a Fantastic future these pair have in the Sport.. 3rd was Lucan's Matteus Tumanowicz. BCBC's Ruuarc Sheridan is learning the ropes well in only his second competitive race.. The Male 7-8 catergory was won by Reuben Byrne, 2nd Callum Clancy and a very worthy 3rd for Courtowns's Mason Lang..
Next up was the Male 9-10 Category, and what a category this is..!! In the Final Speedy Reidy Jnr was pulling a fine move up the inside of Berm 2 when he crashed as he was just about to take the 2 Spot.. He wasn't the only one who 'Wiped Out' , as the Hot Favorite - Lisburn's Brandon Mallon came a cropper whilst in the lead on the 3rd Straight.. The spoils eventually went to Cork's 'Flying' Flynn, Shay, 2nd Callum Dunleavy , 3rd Alex Neville with BCBC's Andre Aroga a Solid 4th.. In the B Final, Ozzy Doherty showed 'No More Tears' and 'Didn't Wanna Stop' as he shouted 'Mama, I'm Coming Home' in 1st Place..!! First season newbies, Luca Murray and Jamie Dumigan are learning the Race Craft Well.. Female 7-10 Carley Hayes.. Need we say any more.. This Kid is unstoppable..Top of the Podium as usual for Carly.. 2nd Chloe Byrne, 3rd Lisburn's Kayleigh Stewart and BCBC's Lucy 'Smiler' Groundwater 4th.. Female Master 30+ The Dinner Ladies as they are affectional known (Am I in Trouble..) are getting Faster by the week.. Anna 'Flip Flop' Szmyt was in Pole Position for most of the day, but was challenged hard by new comer Yvette Deacon.. Anna Claimed the Title with Yvette in 2nd and Emma Fooooorrrrrrrraaannnnnnnn 3rd..
Jnr Men 15-18 What a Tough Class this is, especially as there's some Super Class Guys in here , and they don't Hang about..!! (They even Pedal in Mid Air..!!) Winner of this Category was Ireland's very own Marius Strombergs Look a Like - Mathew 'The Machine' Malone , 2nd Sam Murphy and 3rd David Dorney - all very capable of winning the title on any given day.. PS: You Guys are a Joy to Watch. Master 30-39 This Class included some of the Male 19-29 riders as well and they are Fast..!! Jake Campbell was setting the Pace all day, followed hotly by Joey O'Neill.. BCBC's Speedy Reidy, only back from a year out got caught in Traffic all day but still managed to entertain the crowd with his Crazy Jumping Skills.. All Ireland Title went to Joey 'Flip Flop' O'Neil, 2nd Jake Campbell and 3rd Jonny Reid. Most Important of all, the riders all got round Safe and Sound, especially as The European Championships are next week in Bordeaux.. Good Luck to All Entering The Euros.. May The Wind be Always at your Back..